By the time I post this we’ll have been in the house and Queenstown for almost 2 months already! It’s amazing how time flies. I’ve not posted so much on here as it would constantly sound like we were going on, and on, and on, and on about where we live. 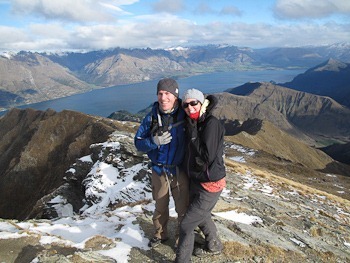 Sure there are maybe better places in the world than Queenstown, but it’s just such a perfect fit for us. We can’t wait for winter (when it finally arrives! ), and we can’t wait for summer and the light evenings. We still pinch ourselves every time we look out the window and walk to and from work and we are nowhere near taking it for granted…. it’s almost so good we dread having to leave already and we’re only just here! In saying that despite having a long list of things to do at weekends we sometimes just sit around looking at the view…. About the only thing we’re missing are our friends and famiies (and our UK salaries would be good!). We haven’t even been in New Zealand for a year so far, yet we’ve done so much. 5 months in Wellington, 3 months touring the South Island, and 2 months or so in Wanaka, with my mum out for 3 weeks of that. 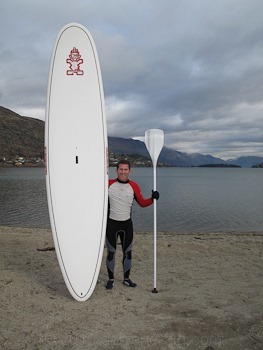 Since arriving in Queenstown we’ve been quickly feeling at home whilst still trying to get on our feet. There always seems to be another bill to settle, another thing to buy….although I’ve been holding off the big tele….but we have been buying more toys (well mainly me)… another beefier mountain bike from a garage sale for me, a pilates machine for Ciara, and I finally have the Stand Up Paddle board I won in Wellington delivered. The garage is starting to look good! I’m also holding out for a car but we’ll see. 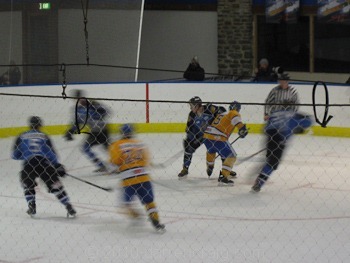 I’ve also started playing ice hockey, and joined a league team to play every Tuesday. It’s something that in the back of my mind I’ve always fancied trying so I checked I could still skate (I said, skate – no mention of turning or stopping), went to a couple of training sessions and before I knew it I had signed up. It’s not everywhere you live that you can join an ice hockey league! Yes that’s me in the yellow jersey on the right! I finally got out on my paddle board on Saturday for a bit in the lake just along the road from the house. 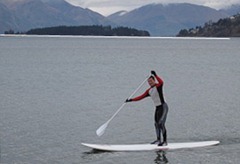 Yes, we should be skiing, but here I am on a lake. It’s been so mild recently with the odd frosty morning. One ski hill has already delayed opening for a couple of weeks and there’s no sign of them opening yet….but the Queenstown Winter Festival starts on Friday with a big fireworks opening ceremony….and there are Winter Games on in August. There’s loads happening here all year round. Work’s going pretty well too. It’s been a bit daunting to take over from someone after them being there so long, but largely due to the lack of knowledge share around the small team. Ciara is off to Sydney with work for a week so I’ll be home alone for the first time in around 13 months. We’ve been staying around Queenstown since we moved in. The furthest we’ve travelled has been about an hour down to Glenorchy, and up the other direction to the vineyards and old gold mining areas. We’ve been mountain biking a couple of times in the bike parks, or along the lakefront. We’ve managed to walk up the biggest hill you can from the centre of town (Ben Lomond at the top of this post – if you are creative you can see this from the house), and up and around the highest skifield. We even went on a boat trip – the same boat we see from the house 3 times a day, but we thought we should sample it from the water looking up to the house! For the first time in a while we don’t feel the need to try and escape where we stay at weekends due to the variety of what’s on offer around us. 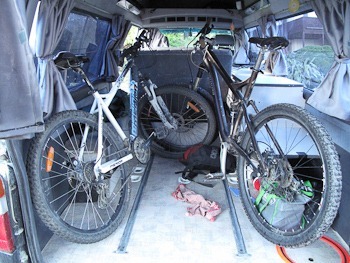 The bikes fit perfectly inside the van if we want them to as you can see below. 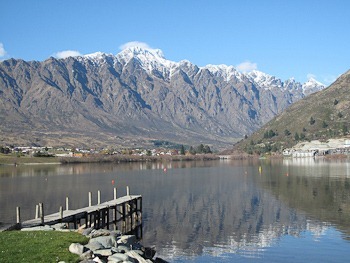 The shot on the right is about 3km from the house as we cycled along the lake looking up to the Remarkables a few weeks ago (there’s less snow on them now!). We’re excited that my dad and stepmum have booked to come out for a month in mid November, and Ciara’s mum is coming over to join us at Christmas. We’ve just had our first overnight visitor so look forward to more. We’d love for so many friends and family to come out and see us, and see what’s around us, but we also realise the massive expense of getting even one person over which is hard. The upside is there is so much to do around here and all the big ticket items are right next to us, or within a few hours or less. 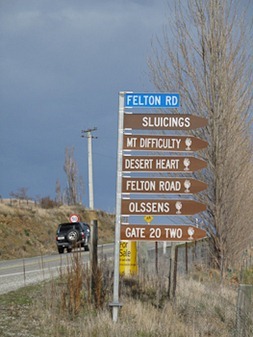 One example is the vineyards we look forward to exploring – they start about 10 minutes away and there are some of NZ’s best ones within an hour, and loads of them – the signs on the right is only at one junction! 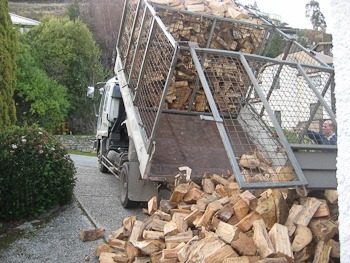 Meanwhile we’re trying to get ready for winter in the hope that the snow arrives soon. 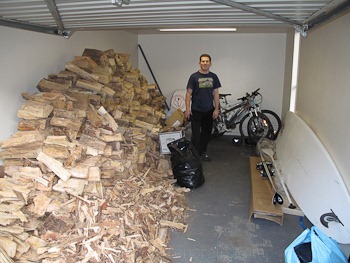 We’ve got the log burner built up and spent a couple of hours stacking 8m cubed of wood in the garage we had delivered at the weekend. As I sit here our heat pump is getting fixed (at the landlord’s expense thankfully!). I’ll try not to leave it so long until the next blog post…..hopefully we’ll get one up of us using these mountain season passes we have! Bring on the snow! My first Pavlova attempt Snow is arriving!